4th of July Patriotic Crafts and Decorations for Kids! The 4th of July in the United States means celebrations, cookouts, fireworks, and time spent with family and good friends honoring Independence Day. 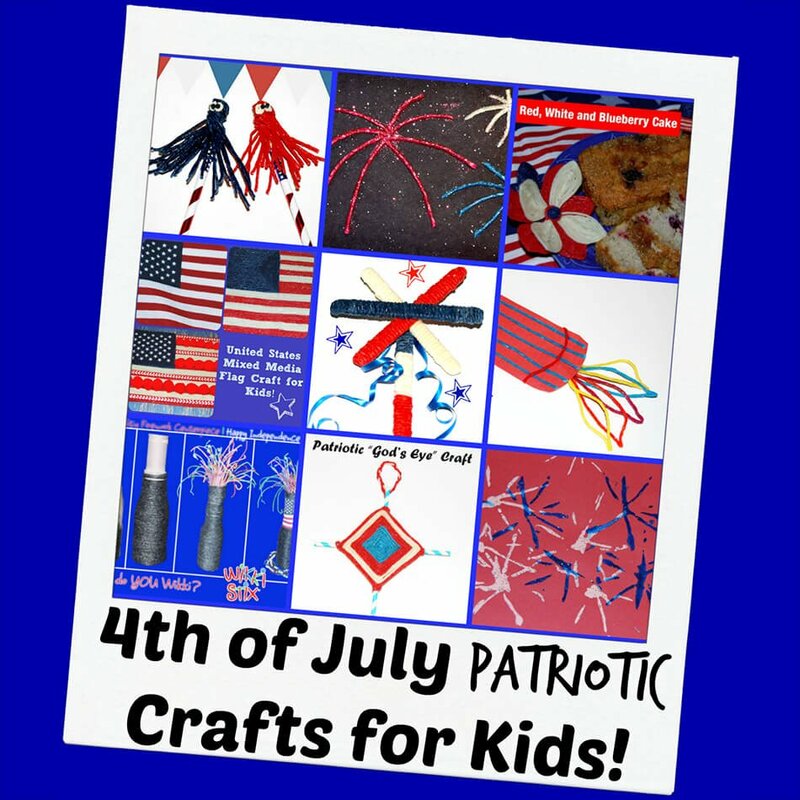 To help celebrate, invite kids to create 4th of July Patriotic crafts and decorations with Wikki Stix. Try a few (or many) of the suggestions below to keep kids entertained while creating and having fun. 4th of July Patriotic Crafts for Kids of All Ages! Invite kids to wrap three craft sticks in red, white, and blue Wikki Stix (one color per stick). 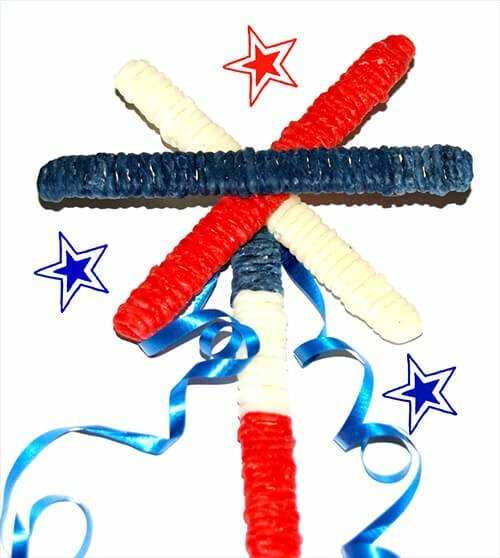 The fourth craft stick can be wrapped in any (or all) of the Patriotic Wikki Stix colors as desired. Have kids arrange the three Wikki Stix-covered craft sticks in a star pattern (make an X with two of the sticks and then place the third craft stick across the center of the X). Press the three craft sticks firmly in place. Wikki Stix is tacky and will keep the star pattern in place without the need for glue or tape. The fourth Wikki Stix-covered craft stick can be pressed behind the star pattern to form a wand. 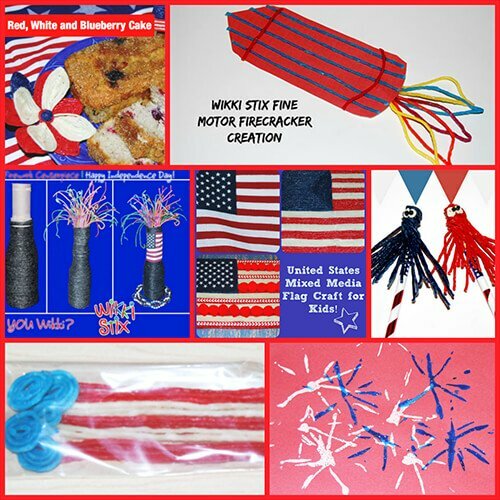 Optional – cut pieces of ribbon to hang from the Patriotic wand crafts. The wands are fun for kids to create and play with during 4th of July celebrations. God’s Eye Craft – The Wikki Stix Ojo de Dios (God’s Eye) crafts make great displays for Patriotic holidays (or any holiday). The beautiful craft symbolizes “God’s Eye” watching over our nation for peace and prosperity. Patriotic Mixed-Media Flag Craft – The Wikki Stix mixed media flag crafts make great Patriotic displays on the 4th of July (or ANY Patriotic holiday)! The flag creations are durable and can be stored inside a plastic bag at room temperature for future holiday display. There is a free flag template to print and create with Wikki Stix. Patriotic Monster Pencil Toppers – These fun Wikki Stix little monster crafts make great pencil toppers. Create and press the Patriotic monster craft onto the top of a pencil for a festive craft that is perfect for 4th of July fun. Patriotic Berry Bread and Decorations for Family Parties – How will your family celebrate Independence Day this July? The Triple Berry Bread is a great choice for family cookouts and gatherings. The bread is moist, filled with summertime berries, and melts in your mouth. The Wikki Stix created Patriotic decorations make the perfect crafts for a festive bread presentation on the 4th of July (or any Patriotic holiday). Firecracker Tabletop Centerpiece – Create a BANG with Wikki Stix at the table. This simple craft uses Wikki Stix to create a firecracker centerpiece for family gatherings. Patriotic Firecracker Craft – Create a firecracker craft to display on the 4th of July. There is a free firecracker template to print and create with Wikki Stix. Patriotic Flags No-Candy Treat Bags for Kids – Invite kids to help make no-candy treat bags for family and friends with Wikki Stix. The treat bags are festive fun long after the 4th of July has passed. Patriotic “Fireworks” Crafts with WIkki Stix – Wikki Stix can be used as a painting tool outside or indoors this 4th of July. Set out simple supplies for kids to create their own painted fireworks with Wikki Stix. From the Wikki Stix family to yours, we wish you a safe and enjoyable 4th of July! More fun 4th of July Patriotic Crafts and Decorations for Kids to Create with WIkki Stix! See links in content!